“The only really effective apologia for Christianity comes down to two arguments, namely, the saints the Church has produced and the art which has grown in her womb” (Pope Benedict XVI in The Ratzinger Report). God’s grace transforms the lives of ordinary men and women into extraordinary spiritual masterpieces. These we call the saints. Perhaps that is why master artists over the centuries have been drawn to tell stories of the lives of saints in painting, sculpture, mosaic, and stained glass. The beauty of a saintly life lends itself to works of beauty that tell of God’s grace at work in the human heart. One such remarkable visual story comes to us from the hand of a gifted Umbrian artist of the 14th century, known only as the Master of Saint Clare. This iconic image, completed in tempera on wood, recounts the spiritual journey of Clare of Assisi, a young woman who renounced the world and consecrated herself to poverty, prayer, and contemplation of God, in imitation of her spiritual brother Saint Francis. 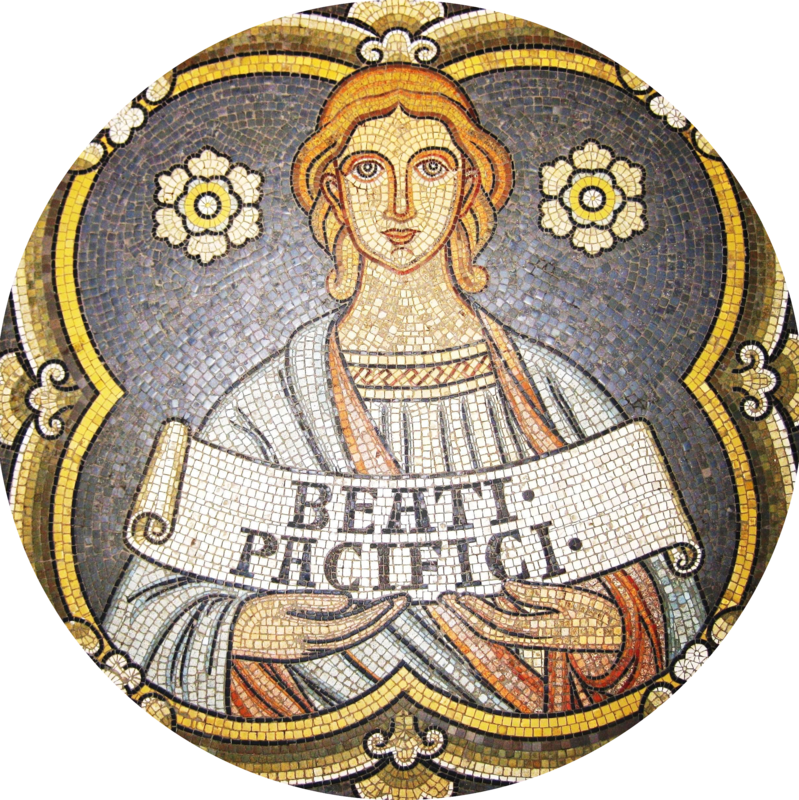 As the Church celebrates her feast day each eleventh day of August, the day of her death, her spiritual journey invites us to recognize the action of God’s grace in our lives. For the light of her faith continues, to this day, to inspire many to renounce the riches of this world and embrace poverty for God alone. Since the 14th century, detailed accounts of the life of Saint Clare have been based on a well-known legend by Brother Thomas of Celano, an Italian Franciscan friar who was commissioned to write biographies of Saint Francis. He is thought to have also authored a spiritual account of Saint Clare that became a source of inspiration for pilgrims and artists, such as the Umbrian Master of Saint Clare. Gazing on the Umbrian Master’s full-length image of this saintly woman, medieval pilgrims to the Basilica of Saint Clare could follow her spiritual journey by “reading” the eight panels that encompass her elongated frame. For the many who were illiterate, what they could not read in books, they could see visually depicted in paint. For each panel reveals one dramatic moment in Clare’s spiritual pilgrimage, unfolding clockwise, starting from the bottom left corner and ending in the lower right corner. To travel along the grace-filled events was to become a pilgrim walking in the spiritual footsteps of Saint Clare. In the lower left corner, we see the first step in Clare’s spiritual journey, when she is said to have received a palm branch from the hand of Bishop Guido. This life-changing moment took place on Palm Sunday in the year 1212. Taking the palm as an exterior sign of the interior call of Christ, Clare fled to the Church of Saint Mary of the Angels to consecrate herself to God. That little church, also known as the Portiuncula, was inhabited by Saint Francis and his community, and became the revered place where the Franciscan movement originated. The second panel shows Clare being welcomed by a group of friars. Their bare feet evoke their embrace of poverty, in contrast to the well-dressed noblewomen who restrain Clare. Soon after, as shown in the third panel, we see Saint Francis receiving the young Clare. She kneels before an altar to profess evangelical vows of poverty, chastity, and obedience as Francis cuts her hair, a sign of her renunciation of the world and consecration to God. The fourth panel, at the top of the left column of scenes, illustrates vividly the violence, malice, and rejection that Clare endured from her wealthy family soon after her consecration. On the left are her relatives, dressed in fine clothes and struggling to persuade Clare to renounce her consecration with threats, flattery, and empty promises. Clare remains firm in her radical promise to Christ as she clings to the altar cloths. Beginning at the upper right-hand corner, the narrative continues with a series of miracles wrought through the intercession of the saintly nun. The upper right-hand scene tells the story of Agnes, Clare’s sibling who left home soon after Clare’s consecration to follow her sister’s example. Once again, enraged relatives attempt to dissuade the young Agnes from making her vows to Christ. This time, however, the family resorts to physical force as they move Agnes out of the convent. Clare prostrated herself in tearful prayer, begging God to overcome the strength of humans by divine power. We see the miracle that occurred soon after, as Agnes’ body became heavy to the point that she fell to the ground, immovable to her frustrated relatives. The next scene depicts another miracle attributed to Clare, during a famine that ravaged the city in 1238. The artist paints Clare blessing a few loaves so that bread is multiplied to feed her sisters. In the next scene, Clare lays on her deathbed on the day of her passing, August 11, 1253. And in the final scene on the lower right-hand corner, Pope Innocent IV celebrates her funeral liturgy in the company of her beloved Franciscan community. The central, full-length figure of Saint Clare dominates the painting. Her haloed face radiates the light of peace that emanates from lives consecrated to God. Clothed in her Franciscan habit, Clare points with her right hand to a processional cross she holds in her left hand. The cross of Christ was the divine light radiating from Saint Clare into the community she founded and into the world. 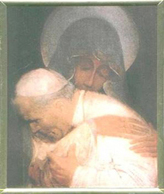 “The only really effective apologia for Christianity comes down to two arguments, namely, the saints the Church has produced and the art which has grown in her womb,” noted Pope Benedict XVI in The Ratzinger Report. As we look for ways to re-propose the Gospel anew to people of today, the saints depicted in artistic masterpieces, such as this vivid depiction of the life of Saint Clare, radiate the light of God’s grace into the world’s darkness. Educator, author, and Secretary for Catholic Education in the Archdiocese of Washington. Saint Clare with Scenes from Her Life, Maestro di Santa Chiara, 14th century, Convent of Saint Clare, Assisi, Italy.